It’s been a long time since I’ve read a Shakespeare play which I didn’t know the end to. Having particularly neglected his less popular works, I decided to take a step in the right direction and read one of his later plays, Coriolanus. I recently picked up a copy of it in light of the Ralph Fiennes film adaptation that came out last year, and since the Commonwealth Shakespeare Company is performing it in the park this summer here in Boston. The first two impressions I got from reading this Shakespeare tragedy (history? Tragical-historical? Maybe Polonius could answer that) is that a) the plot was set up rather strangely, in terms of its opening military sequence and b) the play’s title character is unlike any other great Shakespeare tragic figure. The play is about how a great Roman soldier, Caius Martius Coriolanus, leads Rome to military victory over their hated enemies, the Volsces, only to fall prey to politics back home. Tribunes conspire to have Coriolanus banished, and, in his rage, the renowned soldier joins forces with his mortal enemy, the Volscian leader, Aufidius, to burn Rome to the ground. Roman annihilation is only narrowly avoided thanks to the female pleas of Coriolanus’s mother, Volumnia, accompanied by his wife Virgilia, the chaste maid Valeria, and his own young son. After swiftly arranging peace, Coriolanus returns to the Volsces, only to be mowed down by conspirators working for Aufidius. The tragedy is truly all his own. Considering Coriolanus is a tragic hero, he displays a shocking lack of introspection. We hear no lengthy soliloquies, and all we know of how he feels comes from what he speaks to others. We know we can take his words at face value, since he as no art to not speak what he feels. Caius’s utter lack of people skills, coupled with elephantine pride propped up by almost childish stubbornness, sets the fateful tragic plot in motion. The Fiennes film is fantastic. Set in modern-day Serbia, the text is judiciously cut, making it a very manageable two hours while also maintaining the narrative essence of the play. The film boasts the talents of actors such as Vanessa Redgrave, Gerard Butler, and Brian Cox, besides Fiennes himself in the lead role. Fiennes’ performance is delightfully palpable; every twitch of his face and miniscule change in his voice conveys volumes, never mind his flawless delivery of the verse. Redgrave portrays a magnificent, chilling Volumnia, able to hold her powerful son’s attention with hypnotic, quiet power, crushing all his strength into futility and bending him to her will without raising her voice. She effectively reduces this fearful killing machine to tears. Beyond the acting chops, however, I’m more intrigued by the film’s unexpectedly powerful themes. I will certainly go see the park performance when it opens (playing from July 25th through August 12), but clearly for different reasons than what I found in the Fiennes film. I don’t believe this theme of social equality comes through effectively, or at least prominently, in the film. I found those “common people” eerily controlled. The movie opens with the people being riled to anger over bread shortages, marching to protest the injustice that grain has been kept from the hungry, common people. But “the people” march in complete silence, right up until they reach the granary fence, flanked by armed soldiers. Only then do they begin to shout. Artistic, to be sure, but not realistic. Even when the tribunes are rousing hatred towards Coriolanus, the fickle people change their chants from support to rage in a very unconvincing fashion, almost without batting an eye. I didn’t get a sense of real emotion coming from this so-called “mob”. The film seems to focus more on Coriolanus’s utter disdain for a rowdy populace we don’t get much more than a glimpse of. Their role is secondary to his gargantuan persona, beautifully depicted by Fiennes. I would say the valid sociopolitical theme takes a back seat to the commentary on modern warfare. I was shocked at how horrifying I found the war scenes. I’m used to war movies, and am used to thinking that the media has dampened for all of us the shock-value of modern warfare. Yet when I watched the scenes of civilians peeking nervously out of cracks in their windows as the Romans flooded the streets, and felt the shock of bombs going off, heard the persistent rat-a-tat of machine guns drowning out the 400 year-old words of the text, I found myself stunned in a way I didn’t feel when watching clips on CNN. Shakespeare did not have tanks, IEDs, or TBIs in mind when he wrote the play, and I think the film’s brutal battle scenes add another, sickeningly familiar layer of horror to the action of the play. The results of such combat are ominous as well: Coriolanus is shown experiencing flashbacks, after he leaves the room in order to not hear his “deeds monster’d” (Act II, scene 2). It’s not just a matter of pride anymore; there’s the pervasive sense of alienation, which dominates once the blood-soaked soldier is removed from the battlefield. The links to re-experiencing and PTSD are clear; the horrors of war are as visually jarring as is this scarred warrior in fatigues standing amidst the stiff-suited, soft and voluptuous politicians. 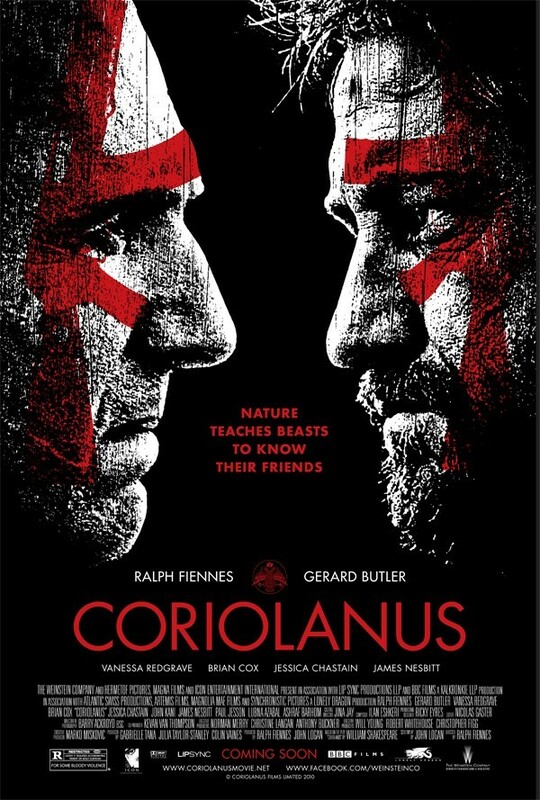 Coriolanus may not be a popular Shakespeare pick, but it is relevant and artful in a very unique way, and should not be missed. Go read the play. Go watch the film. If you’re in Boston, go see the play in the park. I hope you enjoy it. This entry was posted in Literature, Shakespeare, Theatre, TV and Film. Bookmark the permalink.